Last week at the library Logan picked out this Curious George book. I am always creating projects for him based on my picks so when he picked out a book all on his own, I really wanted to make sure that I found something fun to do that connect to his book. I think that's a good way to validate your kid's library/book choices. "Curious George put his finger in a crab tank. Ouch!" We've been reading it nearly every night. I've been trying to think of a great activity. So when I saw an aquarium made out of a strawberry container at 3G= Growing Godly Girlz, I knew this would be the perfect activity. We began by tearing the tissue paper and gluing it to the lid of the berry container for water and plants. Tearing paper is a great way to build those fine motor muscles! We used small fish pictures from the back of a calendar I picked up in the Target dollar spot. They were a little too large. You could probably print something off the internet or even use stickers to make it a little easier. For older kids, they could get very creative and draw their own ocean animals. We taped string to our pictures and then taped the string to the top of the container. That's it! Logan and Tyson love looking in the aquarium. There are many fish related books you could use to tie in to this project. Here are some of our favorites. If you are snowed in... or it's just plain COLD like it is here (single digits), you can click on any of the above links and find plenty of activities and projects to keep your little ones busy! Adorable! What a sweet idea! I bet they were very proud of their craft! Very cute idea! I need a touch of the tropics today! I never can think of a use for those berry containers. How creative! This is such a great way to reuse plastic containers and calendars. The fish tank is so cute. 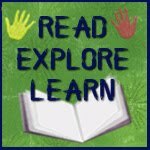 Thanks for linking to Read.Explore.Learn. I will be Stumbling this post. Love the craft! What a great idea! What a cute go along craft. Really clever. What a great way to recycle the berry container. Thanks you so much for linking to my blog - I really appreciate it. Great review Logan - and fabulous craft idea. 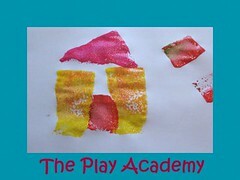 Thanks again for sharing with us at the Play Academy.